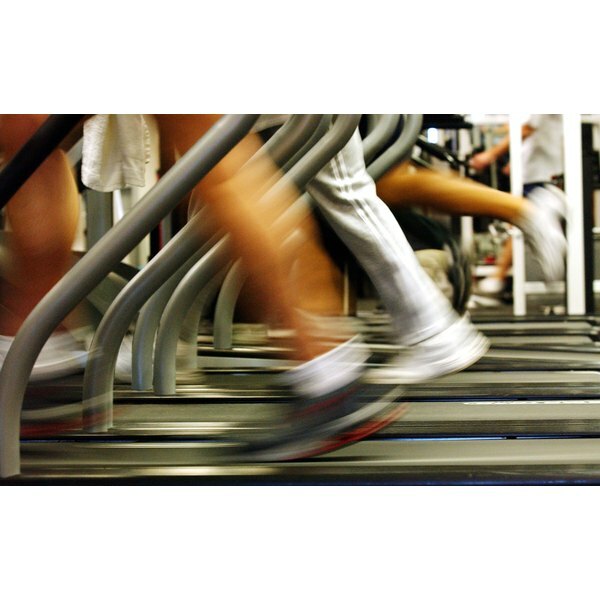 What Does It Mean When Feeling Unbalanced Walking on a Treadmill? There are both medical and nonmedical reasons for feeling unbalanced when walking on a treadmill. Leg length discrepancies, inner-ear disorders and motion sickness are among the medical causes. Your inner ear is the part of your ear that lies behind your eardrums. It allows you to hear and to sense where your body is in space. Nonmedical causes include uneven flooring and poor posture. A leg length discrepancy can cause you to feel unbalanced when walking on a treadmill. A leg length discrepancy is a difference in the lengths of your right and left legs. It is also possible for an apparent leg length discrepancy to be caused by a discrepancy farther up, such as an asymmetrical or rotated pelvis. When you complete a step with your longer leg, you "fall" slightly onto your shorter leg. Some people have slight leg length discrepancies that go unnoticed until they are put in a situation, such as walking on a treadmill, that may exacerbate the effects of the imbalance, according to the Children's Hospital of Boston. The inner ear contains very small calcium stones, called otoconia, suspended in fluid. Because of gravity, the stones hit different parts of your ear as you rotate your head. Your brain uses this information to figure out how your head is oriented relative to the ground. This contributes to your sense of balance, which is required for walking because you are moving in space when you walk. An inner-ear disorder can cause you to feel particularly unbalanced and dizzy when walking on a treadmill, because you are walking over the treadmill belt and the belt is moving under you, yet your brain is unsure of where you are in space. Motion sickness refers to nausea, dizziness or other disorienting symptoms incurred when moving through space. Motion sickness is caused by the brain not being able to make sense of conflicting stimuli, such as visual and inner-ear signals. Most people do not experience motion sickness while walking, but if you have a severe case of motion sickness, it may cause you to feel dizzy and unbalanced when walking. You may feel particularly unbalanced when walking on a treadmill, because not only are you are walking over the treadmill belt, but the belt is also moving under you. There are nonmedical reasons for feeling unbalanced while walking on a treadmill. For example, if your floor is crooked, the treadmill will not be level and may even wobble as you use it. This is turn would cause you to feel unbalanced. You may also feel unbalanced from inadvertently adopting a lopsided posture -- leaning sideways to watch the television while you are exercising, for example.